A popular china pattern... with a twist. In Eternal White, pristine white china replaces the creamy ivory china of Eternal® dinnerware. And the result is simply stunning. 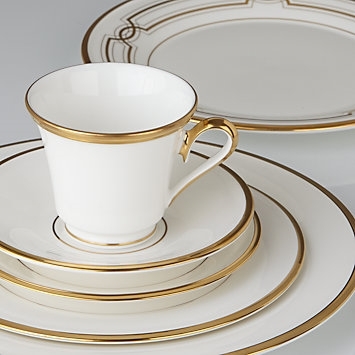 Accents of burnished gold are beautiful against the bone china. Use the pieces together or separately, for any dining occasion. Diameter of dinner plate: 10 1/2", salad plate: 8", bread plate: 6 1/4", saucer: 6"
Capacity of teacup: 6 oz.